Or do you need to supplement your training? People often ask me, "Is Krav Maga enough to defend ourselves, or should we supplement our training with other arts or workouts?" This is an important question which should be answered honestly. The answer is yes, and no. First, it depends with whom you train in Krav Maga. As in most situations it is a case of "Buyer beware". Who is your instructor? What is his training history? On my website I make a point to mention that I have trained in many styles and with many of this generation's great teachers. I mention this because it gives me perspective and depth. If you ask me why I feel certain martial arts, say, Taekwondo, Judo or Karate as they are practiced today, are not enough to defend yourself, I can answer you with intelligence. I have been there, done that, seen it and felt it on my own body. I have also gained from almost every martial art I have studied. I have gained as a student and as a teacher. As a teacher with students from many different backgrounds I can appreciate their backgrounds. I can identify certain martial habits, understand where they come from and work with the student to improve their Krav Maga ability. I can also understand why certain techniques are difficult for them and I know how to help. Without my rich and diverse background this would all be very difficult. Thus, as a teacher, this background certainly helps. As a student, I have added into our IKI program many elements from other styles. Many Krav Maga instructors in Israel are "certified by the IDF (Israel Defense Forces)", while this may sound impressive, what it really means is they completed the very short Krav Maga program offered by the army. They may have trained for only a few weeks in total. IKI Krav Maga is enriched by other styles. The original idea behind Krav Maga in the early days was to take the best of other styles, the most practical elements, add a little Israeli attitude and aggressiveness and make it better. Like Bruce Lee said many years later, "Take what is useful, reject what is useless, cultivate what is truly your own." Bruce Lee warned us against being stuck in any style or cage. He warned us about becoming fossilized. Yet, sadly, many Krav Maga instructors have done just that. They speak of lineage, history, and "purity" and say, "This is the way (founder) Imi Lichtenfeld would do it." I personally do not care how Imi did it, all I care about is how you and I will do it and get home safely. To this end we continue the idea of growing, expanding, and evolving. I have trained in many styles (see page on Martial Arts Leaders ), and have grown from each experience. As such IKI is unique and different. Like modern Israel itself it is an "In-gathering of the exiles", it is Israeli, it is American, it is Russian, it is Japanese and Chinese and Korean. It is ancient and it is modern. This is Israel and this is Krav Maga. We do not become petrified. I love history and I love visiting ancient battle grounds and fortresses. I love tradition but Krav Maga is not about tradition or reliving history, it is about living today and tomorrow. 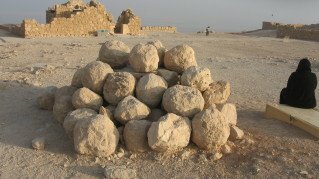 Weapons used by the Jewish defenders of Masada, 66-73 C.E. Times change and so do our tactics. So should you study other styles? No, not really necessary. I have done that work for you. Yes, if you studied Judo it would certainly improve your Krav Maga throws and takedowns, just don't get caught up in the sporting aspects of Judo. Yes, if you studied Brazilian Jujitsu it would improve your Krav Maga ground work, but don't get caught up in the looking for submissions game, this will get you killed on the street. Other arts can enhance your Krav Maga skills, if you have the time for this. Just beware of the dangerous sporting side effects. I believe that an intensive Krav Maga workout will give you all the fitness you need, but you are welcome to add to your fitness training, if you have the time. Krav Maga is designed to be a great time saver, an all in one self defense program. But if you have extra time, sure, go to the gym, do some extra grappling, just stay focused on your Krav/Survival goal. To sum up; IKI Krav Maga is a complete program. You really do not need to look for outside training. It is designed to give you maximum results in minimum time. Stay up to date. Do not be caught training in yesterday's techniques. Join the most innovate Krav Maga program on the planet. With the On Line program you receive daily updates: If you we discover something new here in Israel - you will get it directly to your home computer, laptop or cell phone.